Donald Trump Jr., a man struggling to mend a broken heart, has stumbled upon a solution that will work for right now: a concealed carry permit in the state of Pennsylvania! 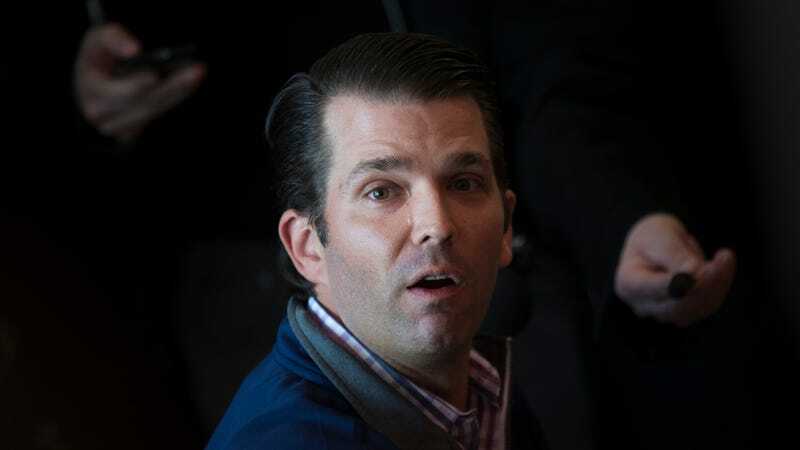 According to the New York Post, Don Jr. recently applied for a concealed carry permit in Lackawanna County; he was issued the permit just five days before his soon-to-be-ex-wife Vanessa filed for divorce. Pennsylvania’s concealed carry permits are honored in several other states, but not New York. Had he applied for the permit in his home state, the Post notes, he’d have to provide tax returns and other financial information. Tricky! Did you know Don Jr. loves guns? He loves guns so much that he told his father, the president of the United States, to stay emphatically pro-gun, even as they watched footage of Parkland students practically beg for change. He loves guns so much that, in 2016, he strapped on a blazer and these comedian jeans and filmed an 8-minute long ad for SilencerCo. He loves guns so much that he and his brother, Eric, own a 171-acre shooting range in upstate New York, so that they might shoot their big guns and disturb their neighbors. He loves guns so much that, early Tuesday, he retweeted this drivel below for all the world to see. Congrats to the happy couple: Don Jr. and guns.